Sleep. We humans spend 1/3 of our life doing it. We all need it, and many of us wish we got more of it. Yet technology, which has transformed so many of our behaviors, has done very little to improve the way we sleep. Some would argue that the impact of technology has been worse sleep. I recently wrote about 8 trends I’m currently interested in for new early-stage investments at Shasta. My colleague Christine and I took a deep dive into one of these areas that fascinates us the most — Sleep Technology. Shasta Ventures’ Sleep Technology Market Map (03/2016). After speaking to several industry experts, entrepreneurs, and companies, we have put together a market map and some thoughts on the category. This is not meant to be comprehensive, and we realize several companies can fit in multiple or different buckets to what we have pictured here. We look forward to getting your input on our work. Why Sleep and Why Now? More than 1/3 of Americans are chronically sleep deprived, and 70 million Americans suffer from sleep disorders. The global market for sleep aids was estimated to be $58.1 billion in 2014, and is predicted to grow to $76.7 billion by 2019. In the past few years, we have started to become more aware of the benefits and necessity of sleep, as well as the serious consequences of sleep deprivation, such as weight gain, heightened stress, depression, and low energy. The last few years have also seen growth in the availability and lowering in the cost of sensors and technologies to monitor sleep. Consumers have become more amenable to wearable devices, using products like Fitbit, Jawbone, and Apple HealthKit to monitor daily activity. The combination of these trends leads us to believe that the time is now for technology — hardware devices, mobile applications, medical treatments, and other products — to dramatically improve the way people sleep. To segment the market of current players in sleep technology, let’s think about our day as four parts: 1) falling asleep, 2) sleep time, 3) waking up, and 4) awake time. Falling asleep is a major pain point for many people — perhaps the biggest trouble the average person has with sleep — especially the 30% of Americans who experience insomnia symptoms every year. For those who struggle to get to sleep, melatonin pills and drugs such as Lunesta have been the traditional go-to solution. However, these drugs come with side effects, including grogginess, nausea, headaches the next morning, and addiction. Among alternatives to pills is Sprayable Sleep, a melatonin spray whose effects sink in slowly, eliminating the feeling of grogginess upon waking up. There has also been a recent development of mobile apps that aim to solve this problem, such as Pzizz and Sleepio — a digital sleep improvement program that uses CBT (cognitive behavioral therapy) to help lower the time it takes to fall asleep. Can technology improve how we fall asleep? We sure hope so, and would love to meet entrepreneurs coming up with innovative solutions for this. The global mattress market is predicted to be $25 billion by 2017. Venture-backed companies such as Casper, Tuft & Needle, Leesa, and Helix Sleep, have launched over the past couple of years to provide consumers a way to buy a mattress direct, online, without shopping in the traditional showroom experience. In addition to mattresses, smart mattress pads such as Eight are enabling consumers to heat or cool their beds for further comfort (as well as providing functionality such as sleep tracking “embedded” in the mattress pad itself instead of a wearable device). Finally, several direct-to-consumer venture-backed brands, such as Parachute Home and Hill House Home, sell sheets and other bedding products that purport to help you get a better night sleep. It feels like more technology will be woven into bedding in the coming decade, like Eight, and we hope that some of this will help users get better sleep. Scientists have been trying to understand sleep by tracking it for centuries. There are several consumer devices out in the market now that enable people to track sleep. Jawbone and Fitbit have sleep tracking capabilities integrated into wearable products. Sense by Hello has a device that clips onto your pillow, and another device that sits near your bed, to track the quality of your sleep, and also offers capabilities such as a smart alarm (hence why we included it in our “Waking Up” section in the market map). Zeo was a pioneer in sleep tracking via a headband, and new companies like Rythm are launching with headband products for tracking sleep, and even improving the quality of your sleep via neural stimulation. Via more data and better computational analysis of data, sleep tracking technologies will continue to get more accurate, and we anticipate that many people will be able to understand in depth the quality of their sleep in the future. Sleep disorders are becoming more prevalent in the general population, and mattresses and tracking devices are unfortunately ineffective in dealing with them. Aside from insomnia, the leading sleep disorder is sleep apnea. Sleep apnea devices are estimated to reach $6.4 billion in annual spend by 2019. Devices such as Airing aim to temporarily fix the logistical issues associated with sleep apnea, including snoring and breathing, while others like Winx are developing novel treatments and therapies for sleep apnea. Who loves waking up in the morning?! There are several mobile apps on iOS and Google Play that act as both alarm clocks and sleep trackers — Sleep Genius, Sleep Alarm all wake the user up at the moment of “lightest sleep” in the sleep cycle (given any 30-minute time window) and provide data of the user’s sleep patterns for the night. However, there are still questions around the accuracy and effectiveness of these apps. An interesting app we also recently came across is Wakie, which tries to make waking up “fun” by replacing the traditional alarm with a phone call from a random stranger. Hopefully these products are just scratching the surface on transforming waking up every morning into a more positive experience. When you haven’t had a great night’s sleep, how do you perform during the day? As a result of chronic sleep deprivation, many people rely on caffeine and tea to help themselves stay awake throughout the day. The average American drinks 2.1 cups of coffee a day! There are a few other solutions to help people stay awake throughout the day — for example, Sprayable Energy, a topical caffeine spray that gives users a healthier and more effective alternative to coffee and energy drinks. Thync is a wearable that claims to enhance your energy and to make you calmer during the day via pulsed neurostimulation waveforms (it also tracks your sleep). We’re looking forward to finding products that discover new ways to boost alertness and performance throughout the day. Many people struggle with mental health disorders, and many of these disorders can impact sleep. While in-person therapy is often prescribed for mental illness, online services and programs like Lantern, Talkspace, and 7 cups of tea can enable people to help get from anywhere at anytime. Studies have shown that mindfulness and meditation can reduce stress, and mobile apps like Headspace and Calm provide easy access to guided meditation. We include these digital services in our sleep technology market map because they can often help people who struggle with sleep but who are not diagnosed with a mental illness. Would you pay for a nap? Startup DOZE offers a nap-booking service that enables access to spaces designated for napping and equipped with nap pods. YeloSPA puts a unique twist on naps — the service combines massages with post-massage naps, providing customers a wholly relaxing and rejuvenating escape from their daily stresses. Is there a market around naps and other ways to recover during the day? We’re not sure, but it’s certainly fascinating. 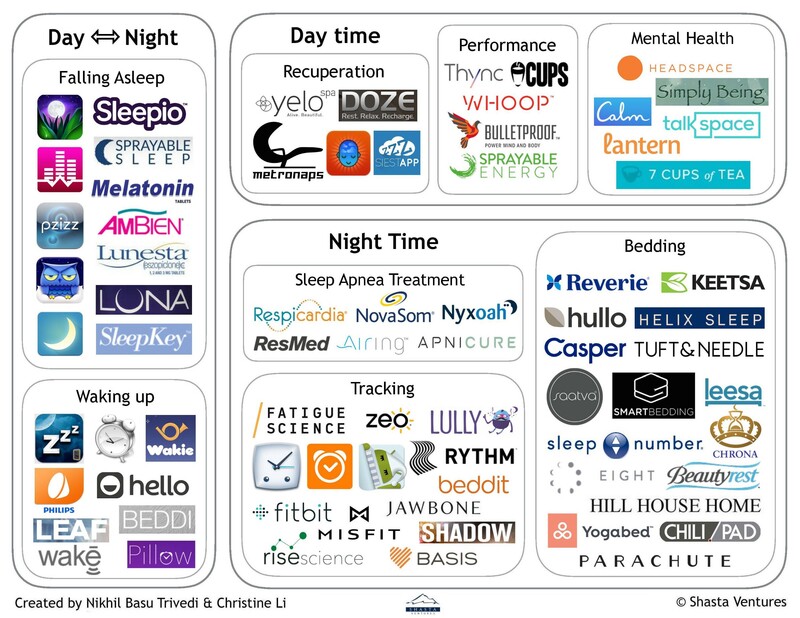 While building this draft market map on the sleep technology industry, we started to ask ourselves: will a platform company emerge that helps people manage their sleep? And if so, what approach or go-to-market will the platform company take to get there? A device in the bedroom? A device in the bed itself? Simply a mobile app or software? Perhaps it will be one of the players mentioned here, or a startup that we don’t yet know about. We hope to expand on this thinking as we dive deeper into the world of sleep, and can’t wait for a future in which everyone can get to sleep quickly, and wake up feeling great.